Difference between revisions of "Xenia Tornado of 1974"
| caption = Ohio National Guardsmen at work clearing debris in Xenia after the 1974 tornado. | caption = A view of two destroyed homes. The night after the tornado, twenty-four hundred people were provided temporary shelter. 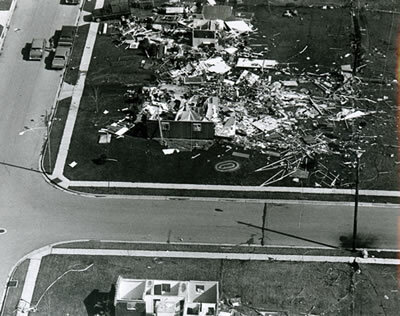 Unfortunately for Xenia, another tornado struck the city twenty-six years later. This storm did significantly less damage, killing one person, injuring several dozen more people, and destroying approximately forty homes. A view of two destroyed homes. The night after the tornado, twenty-four hundred people were provided temporary shelter.